The market for small affordable and portable network testing tools is starting to heat up. Network test tools were long the domain of Fluke (now NetScout) and not long ago they launched a tool called the LinkSprinter. The LinkSprinter brought a suite of tests for the network into a small package at an affordable price. Tying that to a central cloud service that allowed for easy remote diagnostics of network ports. Not content with letting the LinkSprinter have the market to itself, another tool has recently entered a beta testing. Netool.io has released Netool, a device similar to the LinkSprinter, but differs in a few ways. Netool promises flexibility that the might appeal in the software driven world of today. Netool offers the ability to test IP information obtained from the network port, as well as switch side information and ping tests which are very similar to the features of the LinkSprinter, while coming at a lower price point. Couple that with a slick mobile app that provides easy sharing of the testing information and Netool shows plenty of promise. My beta unit had no issues with upgrading to the latest software, which is one of the promises of the Netool – that is easily updated and upgraded as it is built on top of a highly customized version of linux. I’m looking forward to new tests being added to the suite of tests already available, and with the unit having a rechargeable battery built-in is in my opinion a cleaner solution than the AA powered LinkSprinter. However, the LinkSpinter has a couple of features that Netool can’t replicate without a hardware update which makes the LinkSprinter stand out. Coming from a Wi-Fi view of the network, means that I have different requirements for network testing than a traditional route and switch guy might be looking for. 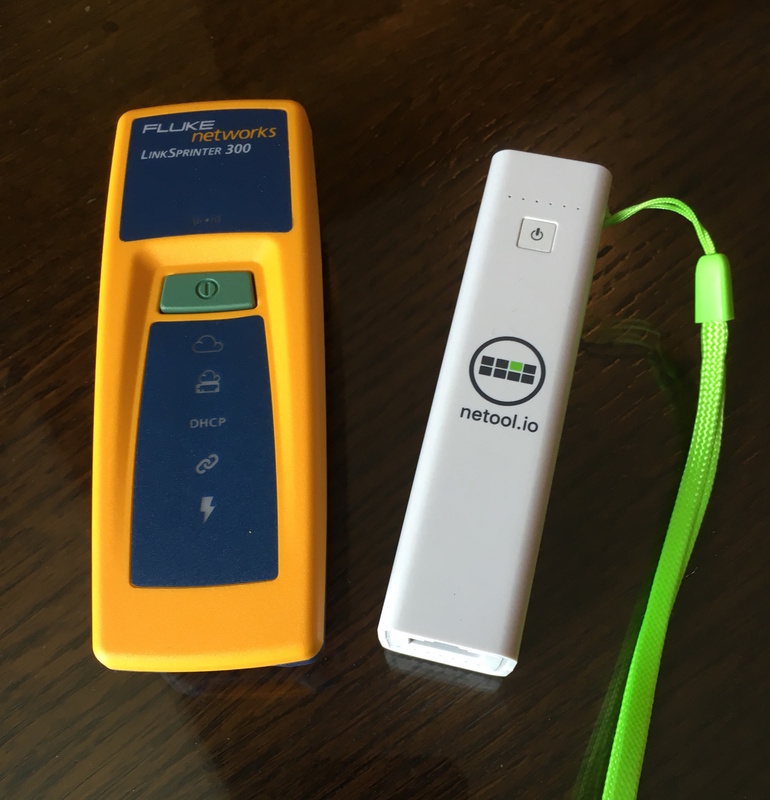 PoE tests are one of those tests that is a must have for me and unfortunately Netool doesn’t support PoE testing, but the LinkSprinter does. Another nice feature of the LinkSprinter is the on-device notification of test status via simple LED lights on the unit. To view this information on the Netool requires using the app on my phone (although that is not a deal breaker). Netool does include a handy feature to see what tagged VLANs are on the network port, which it seems to do by listening to traffic on the port. It’s not perfect since if there is no traffic on that VLAN when the test is running it won’t list that VLAN as being on the port. In my mind, Aerohive had a great VLAN test available in HiveManager (sadly it’s only available in the CLI these days) called VLAN Probe. It worked by sending DHCP “discover” messages on specified VLANs and listening to the returning “offer” message to able to display the DHCP range on the VLAN. It kind of showed the results of two tests. One, that traffic was allowed on that VLAN and two, that the DHCP scope was correct. Two birds with one stone! With WLANs that use local bridging of network traffic, these kinds of tests are very handy. Hopefully either NetScout or Netool will be able to replicate a test like Aerohive’s VLAN Probe, in a way that is configurable for the VLANs that would need to be tested at that site. All in all, these kinds of network testing tools now being more affordable to the masses is a great thing, and hopefully the competition can spur new and innovative ways to test the networks of the future.